Roy McGivern has been appointed the new chairman of Linfield Football Club. He replaces Jim Kerr who stood down from the position at the beginning of the month. McGivern was elected an a special meeting of the Board of Directors at Windsor Park last night. 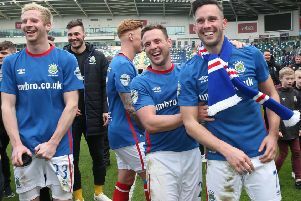 The 50-year-old civil servant from Newtownabbey was first elected to the Linfield Board in May 2014 and has recently served as the club’s Business Director. Speaking to www.linfieldfc.com after his election McGivern said: “It is a huge honour for me to be elected as Chairman of this great club. “I have supported Linfield since I was a young boy and was proud to be elected to the Board in May 2014 to replace my good friend Frankie Taylor. Linfield turn their attentions to the Tennents Irish Cup this weekend with a tricky test away to Championship club, Institute.